How difficult would it be for you to leave the very tiny hometown where you had lived all your life to relocate to another country – especially if Southern California is in that other country? That is exactly what 18 year old Tye Simmonds did when he joined the start-up American JDR/J-Star/KTM Team this past fall. Certainly coming to America was a dream comes true for Tye, but also not a dream without pitfalls. Currently residing in Menifee, California, we caught up with Simmonds who is now ranked 24th in the 2011 Monster Energy AMA Supercross Championship. Racer X: Tye can we first hear about where you’re from? Tye Simmonds: It’s a little town in Australia which only has 3,000 people living there, so it’s really, really small. The town’s name is Bourke, and as I said it’s a very little country town where everyone knows everyone else. I was born, raised there, and lived all my life there – until coming over to the states. All my family is there, and we have lots of places to ride—whether on our own land or our neighbors. There are actually a lot of tracks there. I cannot even count how many! They may not be like that practice tracks in Southern California, but definitely a lot of fun. How could someone like you, coming from such a small town, end up racing AMA Supercross? As I kid I was pretty talented, I could do about anything. I was a swimmer; I played Australian Football, and was even a bit of a boxer for a while! My dad was an Australian Cowboy, so I could have ended up like him and riding bulls, or horses. My uncle rode some, and he was really the first person that introduced me to dirt bikes. One day my dad bought me a little motorcycle; I didn’t like it that much at first, but later I began to really enjoy it, and I never looked back. Simmonds is slowly adjusting to life in America. You’re only now 18 years old, what racing did you do back in Australia? At 16 years old we could turn pro in Australia, so I began young. Even when I was younger my dad always put me in the next level higher classes. At the day I turned pro I raced a 250 two stroke in the 450 class, and didn’t finish that well, but it had me hooked on racing as a pro. So before coming here I raced two years in the Pro class back home, one year in the Pro Lites, then I moved up to the bigger bikes. Given the fact that you came from such a small town, all your family is there, and you are only 18, how is the adjustment with moving to Southern California? It’s been really, really hard, and a lot different than what I had expected. You know, I have always had my dad with me through every bit of racing that I’ve ever done. We’d drive 20 hours every weekend to the races—ten hours there and ten hours back. So we had spent a lot of time together – he had never missed one of my races until this year. He was able to come out here for the opening round, but then he had visa problems and had to go home. When I came over here before the season started I really struggled. I didn’t know that I would have to get a house, furniture, or any of that stuff – I just didn’t realize how hard it was actually going to be. At home all I had to do was to wake up, and ride. But as time has gone by it has gotten better, and I think that I have matured a lot. My dad hopefully will be coming over again soon though, so I’m really looking forward to that. You also took a different approach to racing in America as you immediately went to the big bikes, and not the 250f’s – why is that? Yeah, that is kind of the same as to how it went in Australia where I raced the Pro Lites class one year then went to the 450’s – I’m just too big for a 250. Especially with the guys over here in America; they are smaller than the guys back in Australia. Racing the Lites class back home it was just too difficult to get a good start, and I just had to have it pinned everywhere. I was 17 when I rode the bigger bikes in Australia, and have been on them ever since. 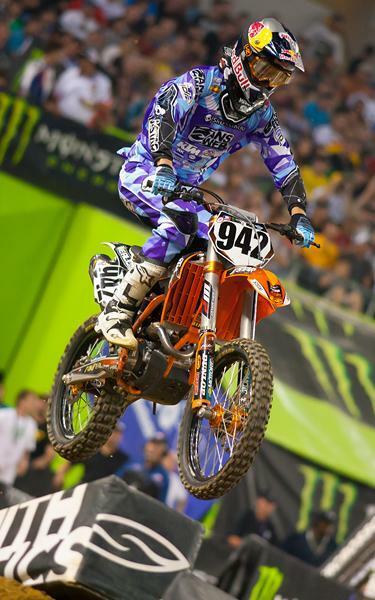 At just 18, Simmonds is one of the youngest riders in the Supercross class. 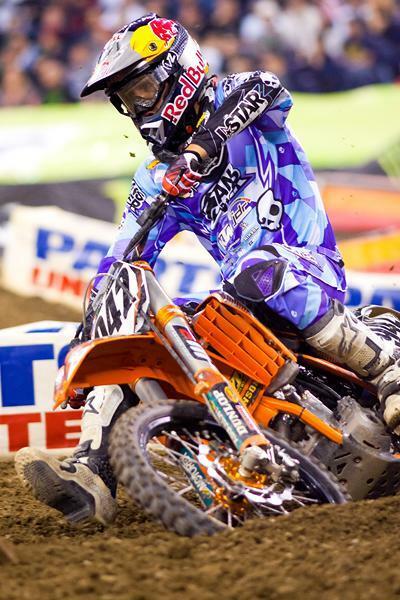 How do you feel about the supercross season so far? I’m a little disappointed. I definitely had set bigger and better goals for myself. But I think that I really let myself down some even before I even came over here. Back home I was really dwelling on being away from home. Of course coming here has been a dream of mine forever, but when it got time to actually do it, things were tough. At first I didn’t really want to leave Australia, and was worried about it, so I may have not put as much into my training and racing as I could have – it showed before I left home, and is now showing here. But I do feel that I have progressed, and now since I have become a bit more comfortable here I believe that I can be at 110% coming into the 2012 season. It’s been hard, but as I said, I can now look back and say that I really have enjoyed it – I’m living my dream. Tye you deserve a lot of credit for what you’ve done by coming over here. With that said, is there anything that you would like to add? I’d really like to thank the entire JDR/J-Star/KTM Team for everything that they have done. Especially I’d like to give Nate (Ramsey, Team Manager) a lot of thanks as he has been beside me 100% - both him, and his family. He has been at the track with me almost every day giving me pointers, so I owe him a lot. Also I want to thank the JDR/J-Star Team Owners Derek and Jay Rynenberg for giving me this chance, and then of course everyone back home for sticking behind me!